Second-story apartment with private entrance in a , fully detached all-brick home, recently renovated with modern amenities. Nestled in the most desirable neighbourhood in Toronto, Little Italy ! South and west-facing windows with all-day sun, year-round! Walking access to everything (countless restaurants, cafes, bars, grocery stores and local markets, transit). 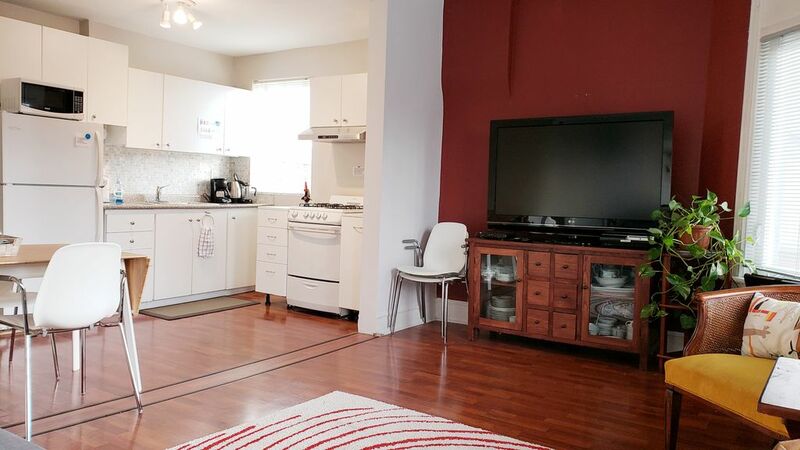 5-minute walk to Trinity Bellwoods, Ossington, Trendy Queen St West. If you want to be close to the action, this place is for you. We are a fun-loving, social couple in our 40s who work from home. We also love to travel, play sports, take in what living in a great city like Toronto has to offer. We bought this property from my parents 8 years ago. It was in the family for 15 years as a rental property for my siblings. Judy and I put of work and love to get it looking as great and as awesome and comfortable as it is now. It is a very special place . We also love the neighbourhood. Wouldn't want to live anywhere else ! We strive to make our guests feel special, with an experience free of worry and hassle. It really is a 5-star experience at a 3-star price. We are so close to so much liveliness and bustle in the city, but it's quiet in our home. This is due in part to the 18-inch think exterior all-brick construction of the house and also the high-quality, soundproofing windows we installed when we renovated. Also includes toiletries , hair dryer, towels, shampoo. We also stock the bathroom with items that you might have forgotten .... toothpaste, razors, Q-tips. Bed linens, extra blankets, pillows. Big, fluffy towels and bathrobes. beautiful, bright ... just look at the photos. massive couch , there's even a library of great books or magazines. and a 55" television w/ cable and netflix. Breakfast essentials in fridge (bread/bagels, OJ, cream, butter, cream cheese). Two slices at a time .... why not ? Spices, coffee, tea, spreads ... please see photos. Everything you could possibly need, but if not, just ask us and we'll take care of it. We can provide an additional table to accommodate 4 people. Massive 55" 1080p television with cable and Netflix. Veranda at front of house. Great for afternoon sun and a drink and people-watching. A great location in a great neighborhood in a great city .Cozy apartment to stay while you navigate your way around a perfectly walkable city . Plenty to do within a stones throw . Located in Little Italy within a few minutes from Kensington Market , China Town, the ROM, the LCBO, and Ossington neighborhood. A few restaurants we would recommend are College Falafel, Frescos for fish and chips and a pint, Matha Roti and Trattoria Taverniti . Highly recommend, so much so that we would do it again. Perfect stay in Toronto's Little Italy! Had a wonderful stay. The apartment is very cozy. The location is perfect. Rick was super friendly and helpful before my arrival. Arriving late that night I was so thankful to have immediate access to a cup of tea from their cupboard and fridge that are stocked with the basics. The location in little Italy was perfect, I was with easy travelling distance to all my downtown destinations. Fluffy robes are supplied with a comfy bed, good internet access, tv and Netflix made it feel like a home away from home. Would definitely stay again and would not hesitate to recommend them to my friends n family. Truly can’t fault my stay. Thank you so much! Thank you for the kind words Nicole. We're so glad you enjoyed your stay and our hospitality. We aim to make our guests feel at home, no matter what part of the world they are travelling from. Everything was perfect! Can’t wait to stay again! The hosts are so sweet! We loved our stay! Great apt. in a great location! Everything about the experience was great! Highly recommended. We are located in the heart of Little Italy in the College and Bathurst area, one of the most vibrant, sought-after neighbourhoods in the city of Toronto. Ample entertainment, dining, coffee shops, transit access, people-watching. We've got it all ! Easy, simple access to any part of Toronto via local transit connections. Access to 2nd floor apartment is via private entrance at front of house. Parking is not included, but street parking is available with purchase of permit from the city for about $5-$9 per day. Also have access to washer and dryer located in basement of house. We live in the lower, separate apartment; however, so noise should be kept to reasonable levels. We are a pretty cool, laid-back couple and love to have a good time, and want our guests to enjoy their stay. We only ask that noise be kept to a minimum after 11PM. No smoking in the house.